3.6. Selection of Ads for impression on the Advertising Spaces specified in 2.2 of these Rules shall be performed by Yandex automatically based on correlation between subjects of ads and the User’s interests. 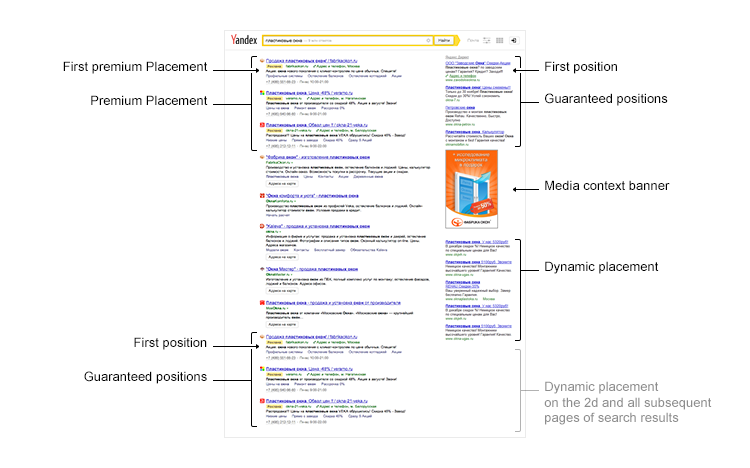 When choosing the “Independent Placement on Different Types of Sites” as a display criterion in the advertising campaign parameters, the Advertiser can fix a Cost per Click for displaying ads on the thematic pages of the YAN member-websites with consideration of the rate applied by the Advertiser according to cl. 3.21 of the Rules. The “Audience Coverage” value displayed in the Client web-interface, when the Advertiser fixes the Cost per Click to display an ad on the thematic pages of the YAN partners’ websites, is for information purposes and means an approximate number of Impressions for that ad expressed as a percentage of the total number of Impressions for advertising materials displayed with regard to a given keyword on the thematic pages of the YAN partners’ websites. The functionality of “Maintain network CPC below search CPC”, described in 3.18.3 and 4.4.1 of these Rules should apply to the Cost per Click, set by the Advertiser, in case the Advertiser chooses one of the following criteria of displaying of the Ads: “Highest available position”, “Cheapest position in ad block”, “Impressions below search results” in the settings of the Advertising campaign, In this case the Cost per Click is calculated automatically with application of the above mentioned functionality. 3.11.1. If the Cost per Click fixed by the advertiser is lower than the minimal Cost per Click applicable for search, Ad will be displayed only on thematic pages of the YAN member-websites (Advertising spaces listed in 2.2. of the Rules) and on the Advertising spaces listed in 2.5 of the Rules. 3.11.2. To determine the minimum Cost per Click applicable for search, for the Group of Ads, the quality factor and efficiency factor shall be taken into account together. However, the minimum Cost per Click is calculated in such a way as to ensure (but not guarantee) the display of the majority of Ads from the Group of Ads on the Advertising Space selected by the advertiser in the manner specified in cl. 3.20 of the Rules. 3.14. 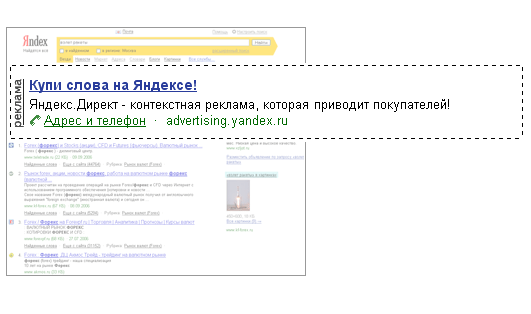 If any Yandex.Direct ad and any Yandex.Market product offering contain links to one and the same Internet information resource (website/domain), or to websites recognized as similar according to paragraph 3.14 of these Rules, only such Ad or only such product offering, whichever has the best value calculated basing on CTR, Cost per Click and Quality factor, will be displayed on the Advertising Spaces. 3.16. Ads displayed on the Advertising spaces through mobile devices may contain a Link to a website and/or a Link to a contact page. When clicking on the Link, the User goes to the chat mode where he/she may in his/her sole discretion make a call at a contact phone number specified by the Advertiser for the particular Ad in a virtual business card. Applying additional functionality «Ads for Mobile Apps» the Advertiser agrees that he is responsible for correspondence of the mobile application icon and information about the mobile application to the applicable legal requirements, including advertising and competition legislation, and also is responsible for the content of the Advertisement created by him with the appropriate additional functionality. Applying additional functionality «Dynamic text ads» the Advertiser agrees that he is responsible for correspondence of the Ads content generated by him using the additional functionality «Dynamic text ads» to the applicable legal requirements including advertising legislation. Yandex does not guarantee that there is no errors in this additional functionality work, also Yandex does not guarantee the correspondence of this work to Advertiser’s goals and expectations. 3.21. The Advertiser could choose in the client web-interface the Increasing rate to the Cost per Click which will affect the selection of Ads to be displayed on Advertising spaces, specified in cl. 2 of the Rules, the Ad position where it is supposed to be displayed, the number of Ads displayed on the specified Advertising Spaces. 4.2. Impression of the Advertising with the pictures, included by the Advertiser in accordance with the p. 2 of art. 3,6. of the Rules, may be made upon condition that Cost per Click is fixed by the Advertiser (with consideration of the rate set by the Advertiser according to with cl. 3.21 of the Rules) at a level not less than the value set forth in the table on page https://yandex.com/legal/direct_table_ch/. 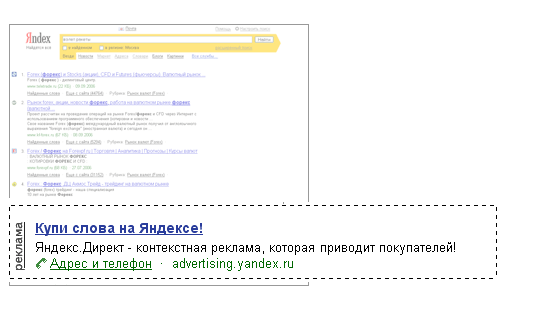 The Advertiser agrees that if the site to which the Link from an ad refers contains in root directory a site icon (favicon.ico file) available for Yandex search system indexation (https://yandex.ru/support/webmaster/search-results/favicon.xml), than the ad displaying on the Advertising spaces may contain a site icon. The Advertiser shall ensure compliance of the site icon with legal requirements including those of advertising and competition legislation. 5.7. In order to improve the quality of Yandex.Direct system and its services, and to develop new offers for the Advertisers, Yandex may periodically carry out experiments ( the duration of each certain experiment not more than 2 weeks). In the course of such experiments, Ads displayed on personal computers and mobile devices of certain Users randomly selected by the system (with the number of such Users not exceeding 10% of the whole audience) and/or search requests (with the number of such search requests not exceeding 10% of the whole audience) may be displayed on the Advertising spaces subject to modified conditions of the Impressions of an Ads including but not limited as to selection and arrangement of Ads as compared to those specified for the Advertising spaces in these Rules. While carrying out an experiment, Yandex does not guarantee that each and every Ad will be displayed in compliance with the order of placing Ads on the Advertising spaces, selection conditions specified in clauses 3 to 5 of these Rules and in compliance with the other provisions specified in these Rules, also the Impression of the Ads may be accompanied by additional information material of the Yandex Services (such as marks of the goods/shops, comments concerning the goods/materials, but not limited). However, the experiments will not affect the Cost per Click fixed by the Advertiser in accordance with clause 4 of these Rules and will not change it in any way. Payment for the Services shall be carried out based on the Cost per Click determined in accordance with clause 4 of these Rules. Any information about such experiments shall be made available to the Advertiser upon its request sent to the customer support service using the feedback form at http://feedback2.yandex.ru/direct/ specifying the reason for its submission and the number of relevant advertising campaign. Following the request, the Advertiser will be provided with information about the upcoming experiments that will start within 7 (seven) calendar days after the date of the Advertiser's request, as well as information about the ongoing experiments carried out at the time the request was received.